One of the most unique aspects of the Lego animated movies has been their sense of instilling creativity and building something original, where your imagination can run wild. The first feature film in 2014 was a surprise hit, and this year’s Lego Batman Movie managed to replicate the success. The Lego Ninjago Movie, on the other hand, seems to be incredibly committed to building things by the instructions. Everything is built to fit neatly into a predesigned formula, from the characters to the vehicles to the plot. There’s still some of that ludicrous Lego humor for a few big laughs, but most of them struggle to emerge from a story that’s more standard than it should be. The Ninjago team assembles. Warner Bros. 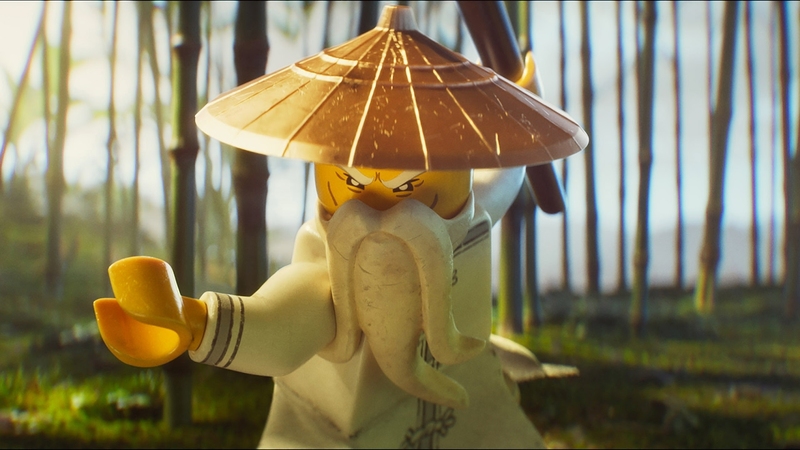 The story—as told by Jackie Chan in live-action bookends in which the only big stunt he does is catch multiple teacups—is set in the mystical and futuristic city of Ninjago. The city is under daily attack from the evil Lord Garmadon (Justin Theroux), a multiarmed samurai demon with skin that is black and tears that are fire, who assaults the city with his legions of henchmen in robotic vehicles and silly costumes of sharks and crabs. Why he wants to conquer the city is never made clear. I guess he needs something to conquer with that large army of his. Ninjago’s defenders are a team of teenage mech-piloting ninjas. The film is already shooting itself in the foot by introducing this large ensemble, most of whom will be kicked into corners when they’re not fighting. Each one represents an element: ice, fire, water, earth, and lightning. The only member of the group that will receive any personality is their teenage leader, Green Ninja Lloyd Garmadon (Dave Franco). And, yes, there is a relation—he is Lord Garmadon’s son. The villain doesn’t know the Green Ninja is his son, but their relationship is already strained enough when Garmadon won’t talk to his son or wish him a happy birthday. What a monster! The first act packs in a lot of the expected laughs that always makes the Lego movies so much fun. Exposition is delivered with colorful visuals and knowing dialogue, quickly jumping into the action of giant robot battles and heroics. One of the biggest laughs in the film comes from an explosion that is repeated from different angles at least six times while the Wilhelm scream plays each time, quickly followed by a surviving henchmen wiping his brow for being one day away from retirement. The action is fun, the commentary during combat is hilarious, and I dug the anime-style robot attacks; Lloyd’s robotic dragon launches an assault on Lord Garmadon with all sorts of missiles, including Head Missile, Second Head Missile, and Backup Head Missile. Lord Garmadon is angry. Warner Bros. But the film wastes its best material way too early with all these hilarious bits, including what should have been the climactic reveal of a live-action cat assaulting the city. To stop the giant cat, Lloyd must lead his team on a jungle adventure to attain the mystical artifacts of whatever so they can harness their blah-blah magic. This is all stated by Jackie Chan’s character, Lloyd’s uncle, trying to sound hip amid his cryptic quotes of mysticism. Despite further developing the relationship between Garmadon and his son in this arc, it feels like filler considering how little comedy can be found in the jungle. But the more I think about it, the more the whole movie fails to find comedy in certain areas. We briefly see the teenage team attending high school, establishing all the expected tropes with nothing unexpectedly hilarious. Seriously? The creators couldn’t find anything amusing to exploit in a high school that has to deal with daily attacks from giant robots? I was amazed that the writers, of which there were way too many on this project, seemed to struggle so much to push through the lesser scenes of establishing the land of Ninjago to get to the action scenes. And while many, many of the giant-robot scenes are clever with their uses of missiles and sharks, they’re perhaps not as thrilling as the movie would want us to believe. It’s disappointing to report that while the other Lego films had an appeal for the whole family, this film is mostly going to appeal to kids. There are a handful of funny jokes specifically for adults, such as a martial-arts film cleverly named HIp Man, but most of the humor is in the simplistic vein of action-packed slapstick and chattering about butts. There’s nothing wrong with a film built specifically for kids, but when you know the Lego movies are capable of more than this, you feel cheated as an adult. It’s as if this film gives one big laugh for the older audience before plateauing with its expected humor and overplayed family arc. Jackie Chan as the old man. Warner Bros. There aren’t any cameos by Legos from other franchises, unless you count Robin Roberts and Michael Strahan voicing their Lego selves as a crossover. The bookend segments with Jackie Chan are confusing in their staging of the story, especially when Jackie whips out an ancient Chinese Lego character made of wood (what a scandal!). And if all these Lego movies are going to end with an end credit song and dance number, this franchise is going to wear out its welcome fast. This series has done a solid job up to now at keeping its commercialism in check without being overbearing. But if the future films continue to be as bland as this one, it will just end up being another shameless toy commercial, originality sold separately.